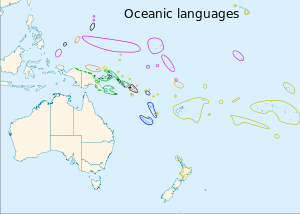 The wastren sphere o Malayo-Polynesian languages. The black ovals at the northwestren leemit o Micronesie are the Sunda–Sulawesi leids cried Palauan an Chamorro. The black circles in wi the green are offshore Papuan leids. The Malayo-Polynesie leids are a subgroup o the Austronesie leids, wi approximately 385.5 million speakers. ↑ Nordhoff, Sebastian; Hammarström, Harald; Forkel, Robert; Haspelmath, Martin, eds. (2013). "Malayo-Polynesian". Glottolog. Leipzig: Max Planck Institute for Evolutionary Anthropology. This page wis last eeditit on 8 Dizember 2018, at 04:10.